One of the best known peppermint essential oil uses is as a remedy for digestive upsets and the beneficial action on the stomach, liver and intestines. It relieves the smooth muscles of the stomach and gut and therefore it is valuable in colic, diarrhoea, indigestion, vomiting, and stomach pain. Use peppermint oil well diluted, to massage the stomach and abdomen in a clockwise direction. Peppermint essential oil helps colds and flu, particularly used in conjunction with Lavender, Marjoram. 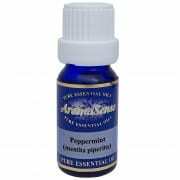 The warming and stimulating properties of peppermint essential oil are particularly valuable at the onset of a cold, to combat the chilly and depressed feelings that often precede the sneezing, runny nose and feverishness. In a bath, do not use more than 3 drops, as more can produce a curious tingling which is more pronounced on people with sensitive skins. Peppermint oil can also be used for its cooling effect in feverish conditions. Peppermint essential oil induces sweating, which reduces a fever in a natural way. It can also be used in steam inhalations to clear the nasal passages and sinuses. It is good to combine Peppermint oil with Lavender to enhance the action of the other. Peppermint essential oil uses in skin care. Steaming can also be used to cleanse and de-congest the skin, especially in acne. Peppermint oil has a mildly antiseptic effect which helps to control the bacteria on the surface of the skin. Cold compresses of Peppermint, or Peppermint and Lavender, applied to the forehead and temples will relieve headache, and sometimes migraine, though not all sufferers can tolerate the smell. The compresses are most effective if they can be applied at the first sign of the pain. Both these oils are painkillers, but while Peppermint oil is a stimulant, Lavender oil is a sedative. The combination of stimulant and sedative is found in many commercial pain-killing preparations (aspirin) but with the important difference that essential oils do not merely suppress the pain, but work on its causes, such as blocked sinuses, a congested liver, or mental fatigue. Peppermint is one of the oils described as ‘cephalic’, that is, they stimulate the brain and air clear thinking. (Rosemary and Basil are others.) any of these oils will physically clear the head leaving the user feeling fresh and bright and ready for mental effort. peppermint is sometimes used as an emergency treatment for shock, because of its stimulant properties. Just put a few drops on a tissue, or inhale directly from the bottle. This can also help to relieve nausea. Peppermint is a useful deterrent as vermin dislike the strong odour of Peppermint. Sprinkle it on the runs of mice, rats, and they will go away. You can combine Peppermint essential oil with Eucalyptus essential oil. Peppermint should not be used if any homoeopathic remedies are being taken, and must be stored far away from such remedies, as it can antidote them. Do not use Peppermint in the evening, as it can cause wakefulness.